Semmelweis, a Hungarian physician, was born on July 1, 1818, in Buda (now Budapest, Hungary), in what was then the Austrian Empire. He received his medical degree from Vienna and in 1846 accepted a position as first assistant of the First Obstetrical Clinic at Vienna’s General Hospital. At the time of Semmelweis’s appointment, 25 to 30% of women who delivered babies in the clinic died. They died of a disease known as puerperal fever, often referred to as “childbed fever.” This infection was claiming the lives of new mothers and babies all over Europe. Most doctors at the time assumed it to be a contagious disease similar to smallpox. Semmelweis was alarmed by the number of lives the disease was taking in his clinic and began making careful observations. He noted that medical records showed that the mortality rate was much higher in the clinic where doctors delivered the babies than in the clinic where midwives delivered babies. Semmelweis also looked into the death of his former professor, Dr. Phillip Kolletchska, who had accidentally punctured himself while performing an autopsy on a patient who died of puerperal infection. The professor died of complications identical to those of mothers who had died of the disease. Putting his observations together, Semmelweis concluded that the disease was being passed from deceased mothers to mothers in the delivery ward on the hands of the doctors. He immediately initiated a policy of having all doctors wash the hands in a chlorine solution that would kill the agents of the disease, especially after performing autopsies. The number of deaths in Semmelweis’s ward dropped from 18% to 1% in 1848. Other doctors did not accept his findings and were infuriated by the fact that he was telling them they had to wash their hands in chlorinated water. Semmelweis was dismissed from his job. He went to other clinics and initiated his hand ­washing policy. In each case the number of deaths from puerperal fever dropped dramatically. In 1855 he accepted an appointment in obstetrics at University of Pest, in Hungary, where he married and had a family. His ideas gained acceptance in Hungary, but throughout the rest of Europe, they were denounced. 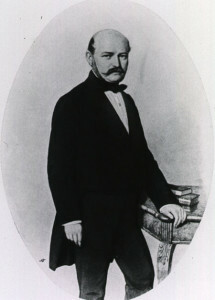 Semmelweis published his findings in 1861 in Etiology, Understanding and Preventing Childbed Fever, which he sent to many doctors and clinics outside of Hungary. However, most doctors still refused to accept his findings and to follow the hand­ washing procedure. After many years of fighting to implement his policies, Semmelweis suffered a breakdown in 1865 and was taken to a mental hospital. He died on August 17, ironically from puerperal fever contracted through a wound resulting from surgery he performed prior to his admission. Semmelweis’s discovery of the cause of puerperal fever had a major effect on the longevity of women, and his solution for it would help to reform medical practice and save many lives. During his life, Semmelweis’s influence was aggressively countered by the medical establishment who resented the fact that they were ordered to wash their hands after autopsies. His influence, however, did not die with him. Some doctors saw the logic in his discoveries, and two scientists were particularly influenced by him: JOSEPH LISTER and LOUIS PASTEUR. Lister (1827­1912) was a British surgeon who advocated antiseptics and acknowledged Semmelweis’s example. Pasteur (1822­1895) was a French chemist and biologist who proved the germ theory of disease, founded the science of microbiology, invented the process of pasteurization, and developed vaccines for several diseases. Semmelweis’s Etiology, Understanding and Preventing Childbed Fever, while not accepted during his lifetime, later was regarded as a milestone in medical history. Semmelweis’s legacy, however, goes beyond the field of medicine. While some learn from his medical findings, others learn from his life. Despite his well ­grounded findings, Semmelweis was rejected, often with hostility. This has become known as the “Semmelweis reflex,” referring to the tendency of authorities to greet a discovery with open hostility.